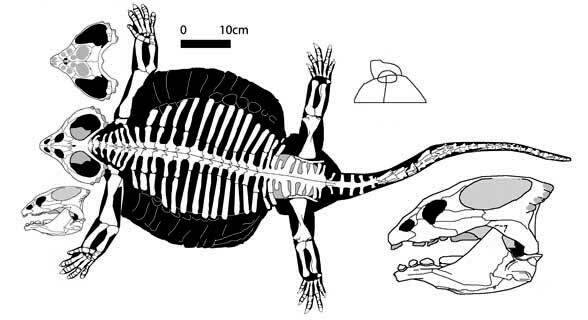 – Discovery: Cyamodus was a placodont known from fossil remains found in Germany. It was named by Christian Erich Hermann von Meyer in 1863. It is the type genus for the group of placodonts known as the cyamodontids; the group of heavily armoured placodonts. – Description: Cyamodus was a fairly small placodont, growing to around 1.3 metres in length. Its most characteristic feature is the two-part shell carapace found on the upper surface of the body. The larger half of the shell covered Cyamodus from the neck to the hips and spread out so that it almost encompassed the entire limbs. The second, smaller part of the shell covered the hips and the base of the tail. The shells themselves were covered in a mixture of hexagonal and circular plates of armour. The tail was stout and covered in a number of osteoderms, as were the proximal portions of the limbs. 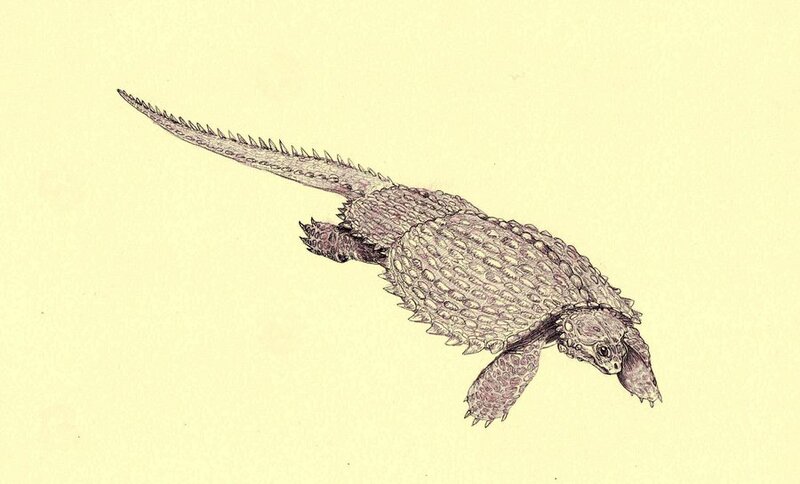 It is thought that Cyamodus would have dragged its broad, flat body along the shallow sea bed, searching for shellfish, in a similar manner to that of modern day stingrays. Some researchers have suggested that, because of its strongly developed dentition, strong limbs and deeper body,Cyamodus was less bottom-dependent and possible more mobile than most placodonts, perhaps living in rougher waters or a more rocky environment. It has also been noted that juvenile specimens of Cyamodus have an extra tooth on the roof of the mouth, compared to adult specimens. This suggests that Cyamodus reduced the number of teeth as they grew to maturity. This entry was posted in Triassic - Placodonts and tagged cyamodus, dinosaurs, placodonts, prehistoric, triassic. Bookmark the permalink.